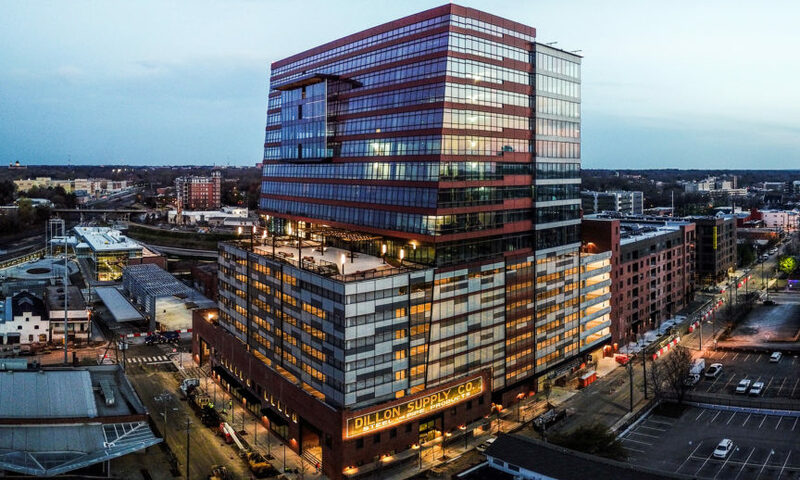 (Raleigh, NC – April 12, 2018) Kane Realty Corporation and FCP℠ are excited to announce that several original commissions are set to be installed at The Dillon in Downtown Raleigh. Curated in partnership with CAM Raleigh, local and regional artists will be featured in the new mixed-use development project including: Jason Craighead, Oliver Wagner, Heather Gordon, Thomas Sayre, Caitlin Cary, Ben Knight and Tim Lyntinvenko, whose 30′ x 66′ work will be featured on the exterior of the building. The works will include painting, photography, mixed media and needleprint and will be available for public enjoyment. In addition to original art, the project will feature many salvaged and repurposed materials from the 100-year-old Dillon Supply warehouse. Preservation of a significant portion of an exterior brick wall featuring the iconic Dillon sign will allow a sense of the building’s history to remain. Reclaimed elements also include old castelated beams remade into a trellis on the building’s 9th floor, dock swingarms transformed into exterior light fixtures, hoistway equipment re-mounted in the building’s portico and residential lobby, the original warehouse doors installed in the elevated lobby, factory fans transformed into tables and original railroad tracks embedded into the building’s front door hardscape. Vintage photographs and memorabilia from Dillon Supply Co. and the Dillon family will be on display, including a portrait of Mr. Dillon. “We are honored to have The Dillon as a new neighbor and creative partner in developing amazing opportunities for artists in North Carolina,” said Eric Gaard, Exhibitions Director at CAM Raleigh. The inclusion of original, public art at The Dillon celebrates the creative history of the Warehouse District and adds to a distinctive office, retail and residential experience. Art will be on view for guest later this Spring.